When I look for recipes through cookbooks, various internet sites and other blogs, “healthy” is never a term I apply to my search criteria. That’s not to say the meals I make are junk food, or even bad for you – I try my best to stick to the lower tiers of the food pyramid. However, I can never ignore a craving and love nothing more than a hearty, satisfying meal. “Healthy” to me has always meant plain, simple, flavorless recipes. Boring. In the past year, I have picked up running as a hobby to compensate for my “eat, drink and be merry” philosophy on food, and have grown to value my time on the road (or on the treadmill) for more than the physical benefits. It had become so enjoyable that I dedicated the past two months to training for the 10-mile Broad Street Run, which took place this past Sunday in Philadelphia. My boyfriend and I, our families and friends all decided to run as a team and celebrate our finish with a tailgate in the South Philly stadiums’ parking lot. The week of the run, I hastily decided to eat light, refrain from alcohol and drink plenty of water. Not only did I want to eat everything I could not, it became difficult when I wanted to spend time in the kitchen. Like I said, I don’t search for “healthy” recipes. Runners World’s website was a reliable source for training tips when I wanted to improve my running skills; however, I never realized the magazine’s website had quite the catalog of recipes. Their Recipe Finder feature allows you to search by course, ingredient and cooking skill, and even health concerns. Surprisingly, I saw no recipes that were flavorless and boring, and I even had a hard time deciding which one I wanted to try. 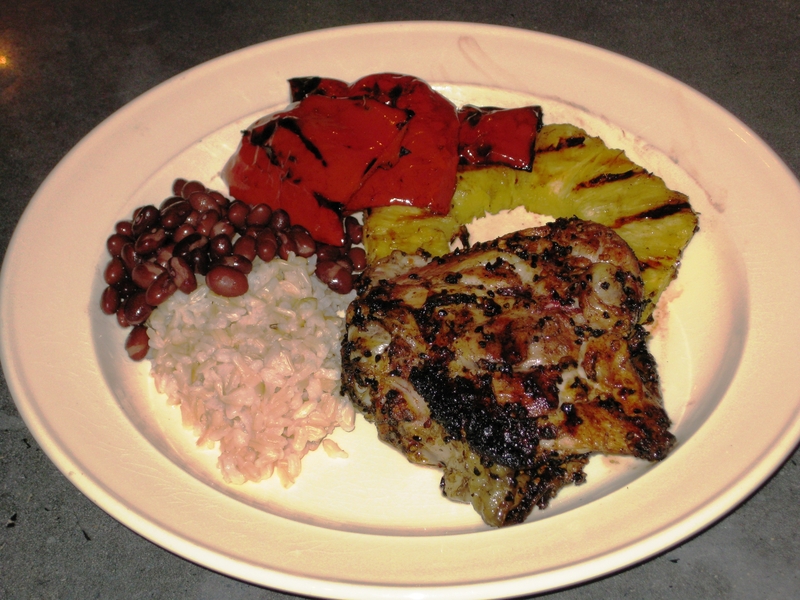 I settled on a grilled Jerk Chicken recipe with Pineapple and Red Peppers. There’s no denying, this recipe is pretty straightforward. It does not include obscure ingredients, several different cooking methods, or involved steps. One of the highlights of this recipe is the ingredients can be gathered in a 5-minute, inexpensive grocery run. Another highlight of the dish was, of course, the flavor. 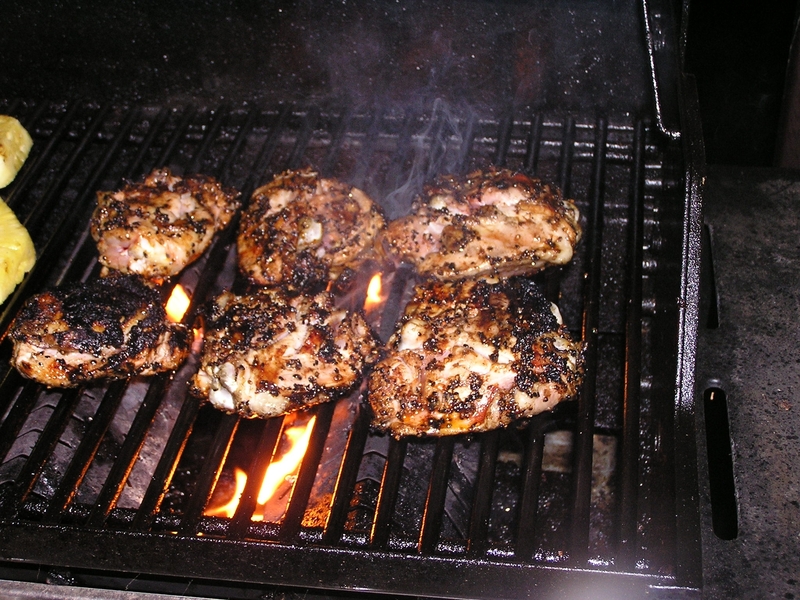 Jerk seasoning includes different combinations of spices (most of which are already in your pantry, if you care to make it on your own) that create a sweet, savory and spicy coating on the outside of the meat. Once the meat hits the hot grill, a delicious, crunchy coating forms that gives you no reason to reach for any condiments to add on the side. 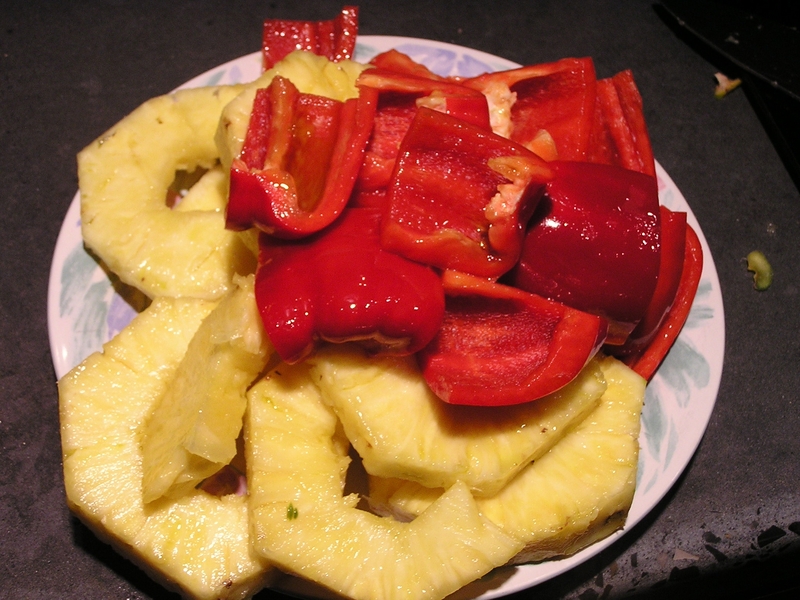 The pineapple and red pepper grilled perfectly; however, I kept them near a grill burner that was set to a lower setting as they both cook faster than the chicken. Combining the cooked fruit and veggie with a bite of chicken contradicted my initial impression of any recipes in the “healthy” category. On top of that, grill marks on anything make it enticing. The few months of hard work paid off, and though I doubt my healthy week of eating had anything to do with a smooth run, I definitely did not suffer for it. To be honest, I think my successful completion of the ten miler had more to do with the festive tailgate waiting for me at the end. Who doesn’t love grilled pineapple and chicken! I love how simple this recipe is! Will have to give her a try. I will be posting my Pineapple BBQ Chicken skewers and Grilled pineapple with Spiced Rum on Icecream later this week Would love to get your feedback!